And seven makes nine … the Sebire siblings finally ready to leave the house. Now technically we all know how to get somewhere on time. I was raised in a Navy family so we would actually always be early. To everything. It was such a pain when your dad was always the first parent to pick you up from a party. 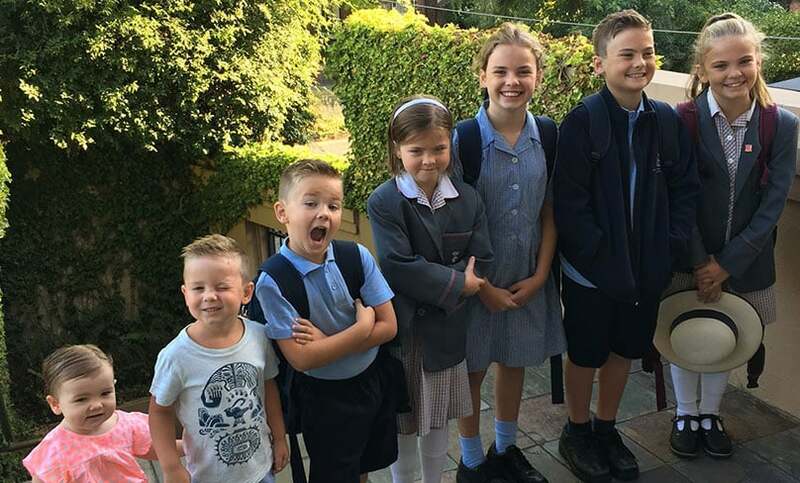 And as an adult I was always early and organised….. until seven children came along and we became a household of nine. Now getting everyone dressed and organised with everything they need and to school on time is one of the biggest jobs I have. Someone sleeps in, someone can’t find a shoe, someone only wants a ham sandwich for lunch and someone else ate the ham last night. I never know what exciting things are going to happen during the day but as our family has grown I’ve learnt that if I’m not organised then we will be seriously late. So here are my tips, I try to follow them every day but sometimes slip up…. – School shoes, bags and hats live by the front door. If they don’t then we lose things and contents of the bag end up around the room and we will be late. – Always buy an extra sun hat for each child because they go missing. You will always use that hat. Trust me. – Library books are only allowed to stay downstairs and in the one spot, we had to put this rule in place when one child kept losing books – we’d find them months after I’d paid the fine – stuck down the side of a car seat or under a mattress that we hadn’t checked or at the back of the closet near the front door in a bag. – We always have bread in the freezer, long life milk in the fridge, snacks hidden away in the pantry and some sort of fruit in the fridge so that we can always fill a lunchbox. We had to do this when we moved to a school with no canteen. – All clothes are laid out in the one spot the night before and that includes socks and underwear. If we don’t then you can be sure I have a kindergartener walking around in toddler underwear telling me that his undies are too tight. I even put my own clothes out the night before so I don’t have to worry about what to wear. – Sports and library days are written up on the fridge so I can see them as there are too many days to remember. – I sign notes the day they come home and they go straight back in the school bag for the next day, party invitations go straight on the fridge and I RSVP straight away otherwise we forget. – In the morning I have to go around the bedrooms a few times just to make sure people are actually out of their beds. Just calling out to me that they are getting up is not enough. I need to see signs of life and moving bodies before I leave them alone. I am a morning person but some of my children are not. – There is no TV until you are dressed and with shoes on…now this one we sometimes break because I need to entertain 2 little ones with ABC for Kids while I’m getting everyone else ready but it’s a good rule if you can make it stick. – All hair supplies are kept in the top drawer in one bathroom. If I find them while I’m cleaning they go straight to the drawer. This was a recent initiative I put in place because we could never find a hairbrush. A good tip is to buy a roll of ribbon from a craft store in school colours so you always have hair ribbons on hand. – Make friends with the ladies in the front office and don’t be afraid to tell the school if there are serious reasons why you can’t get to school on time.